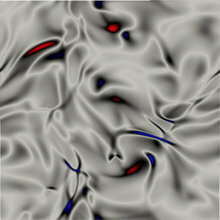 A study of turbulence in BZT dense gas flows is performed using DNS. It is shown that for a large but realistic intensity, the turbulence in dense gas flows behaves in a highly compressible manner when the average thermodynamic state lies within the inversion region in which the gas fundamental derivative is negative. A close similarity is observed in the evolution of the kinetic energy when the initial turbulent Mach number and the Taylor Reynolds number are matched regardless of the Equation of State (EoS) considered. A large turbulent Mach number is yet more easily attained in dense gas flows lying in the inversion region because of the low speed of sound associated with it. In this case the turbulence shows a highly compressible evolution with periodic exchanges between the internal and kinetic energies. In order to assess the capabilities of currently available Large Eddy Simulation (LES) subgrid-scale models, a-posteriori tests are performed using the dynamic Smagorinsky model. Coherently with the hypothesis it relies on, the model perfectly captures the evolution of the kinetic energy when the turbulent Mach number is low enough. When using the perfect gas EoS at a higher turbulent Mach number the agreement is reasonable. Yet, when the average thermodynamic state lies within the inversion region and when using the thermal and caloric Martin&Hou EoS, the model is not able to capture the correct evolution of the kinetic energy. The results presented in this study call for a specific research effort directed towards the assessment and possibly the development of advanced subgrid-scale models for LES of turbulent dense gas flows.